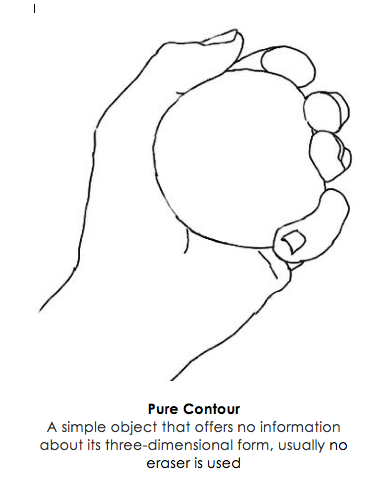 A contour drawing shows the outlines, shapes and edges of a scene, but omits fine detail, surface texture, color and tone. 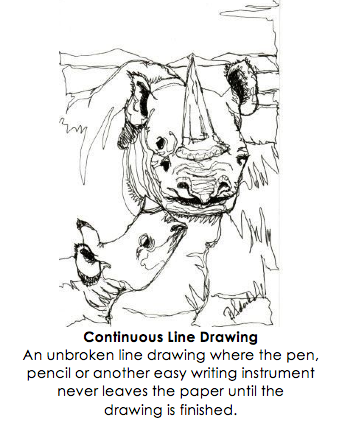 A contour line drawing is deliberately and slowly executed. It defines edges, including planes, interior, and exterior edges. Lines are not sketchy and usually show details. Sketch and label a example of each of the following terms. Contour line drawing requires that you keep your eye on the model, not on the paper. Imagine that the pencil is touching the model instead of the paper. Then slowly move your eye across the contours of the model and allow your eye to pull your pencil along with it. Calligraphic lines in drawing are just like using accent in talking -- we put emphasis on certain words to place more importance on them and the same applies in art, too. 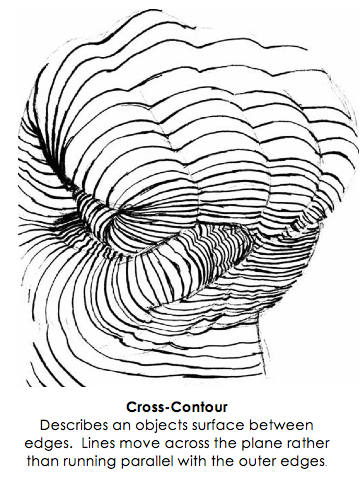 The contour lines are accented with a variety of line weights. Contour lines look flat and 2-D. Calligraphic line drawings look more 3-D. It's not interesting to talk in a monotone and similarly just using one consistent line in a drawing makes it look uninteresting. So, to change that, all you need to do is use pressure on the pencil to accentuate particular places you want to make a statement with. Accentuate lines nearest to you (everything is more distinct when close up). Accentuate only one side of an object and/or lines on the bottom (to represent shadow and weight). A drawing process where the eye is trained to follow the contours of what is being drawn, looking only at the subject, not at the paper. 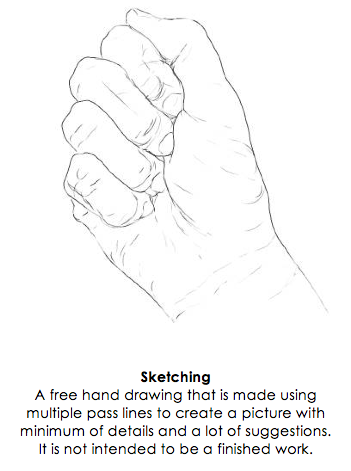 In this process, the hand moves the drawing tool in synchronization with the movements of the eye. If you want to increase your observations skills, try doing some blind contour drawings. Blind contour drawings are done by drawing an object without ever looking at the paper. The final drawing is not important, although you may be surprise at how recognizable the object is when you are done. The most important thing is to carefully observe the object and don't rush, just take your time and don't peek! This video demonstrates two concepts. The first is drawing with a continuous line so that the pencil never leaves the paper. This often requires that you back track over a previous line or you create a line where one does not naturally occur. The second technique is a partially blind contour drawing. 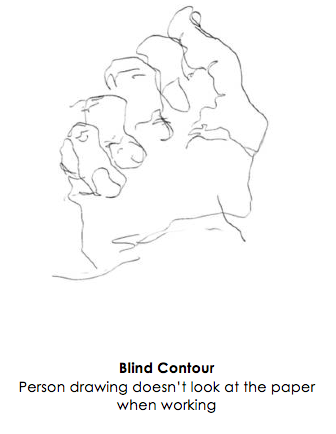 Unlike a blind contour drawing, you are able to look at your paper, but you are limited to mostly looking at your subject rather than your paper.